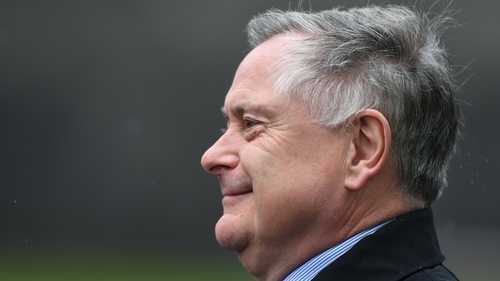 Labour Party Leader Brendan Howlin has dismissed calls for a change of leadership, saying the party needs to focus instead on its key message of ending poverty and homelessness. He was speaking as the party gathered in Drogheda for the first of a two-day think-in. His comments follow calls for a change of leadership from a group of councillors over the summer. "Changing the leader is not going to change the party," he told RTÉ News as he prepared to address party members this afternoon. "What we need to do is engage with people who support our ideas," he said. He said they had published a comprehensive policy document outlining a €16bn plan to build 80,000 social and affordable homes over the next five years. He said the party's policies also aim to tackle the cost of building and land, affordable rents and security of tenure. Mr Howlin said there would be an open debate on all issues over the two days and he was confident that what will emerge "is a united, determined Labour Party with one ambition to rebuild the party". He said he understood the concern within the party over their performance in the polls, but added that they all wanted the party to succeed. Mr Howlin also said the Labour Party had shaped the social and economic agenda of Ireland over the decades. Labour Senator Ged Nash said he was confident the party could win back the seat they lost in Louth in the last general election. Tipperary TD Alan Kelly - who also called for a change of direction in the party over the summer - said there would be a frank, robust and open discussion today on future strategy. Asked where he stood on the leadership issue, he said: "It’s never been about leadership for me. It’s about the future of the party. We want to go back to our roots. Back to what we stand for, real issues that affect working people". Meanwhile, in an opening speech Mr Howlin told party members that he "would continue to lead, outlining the value and beliefs of Labour in clear language" and dismissed "suggestions that the party is not energetic enough". However, he acknowledged that the party had lost the trust of many people who should be supporting them. "And I can repeat the message that we are truly sorry - I am sorry - that many people suffered hardship on our watch," he said.